The Saturday was awful! I got up 5:00 in the morning to get ready for the starting line event. 5:30 – I left home. Driveway had very thin layer of ice, but the road was just wet. I see some snow on grass. 6:40 – Entering Wilmington. Snow storm. Road is covered with 1/2 inch of ice. Slipperly. Pass one car going 15 miles per hour. 6:45 – Almost there to get off ramp on SR73. Gust of wind simply slide me sideways into a guardrail. I was only going 30mph or could be even less, everything happens so slow, I even had enough time to look back and make sure there’s no car behind me to crash in to me. My trusted watermelon is still drivable. Get off the ramp, and check her. No leak, bruised bumper and fender. Sad… But gotta get moving. 7:20 – Thanks to fellow autocrossors, I finaly got released from the ditch. Here is the poor watermelon. She is hurt, but she will survive. A slight love tap on fender will bring her back. Cincinnati SCCA held their Point Event 1. It was still cold in the morning, but the surface was dry, and I am ready to test my new silver Miata (still haven’t named her… Any suggestions??). 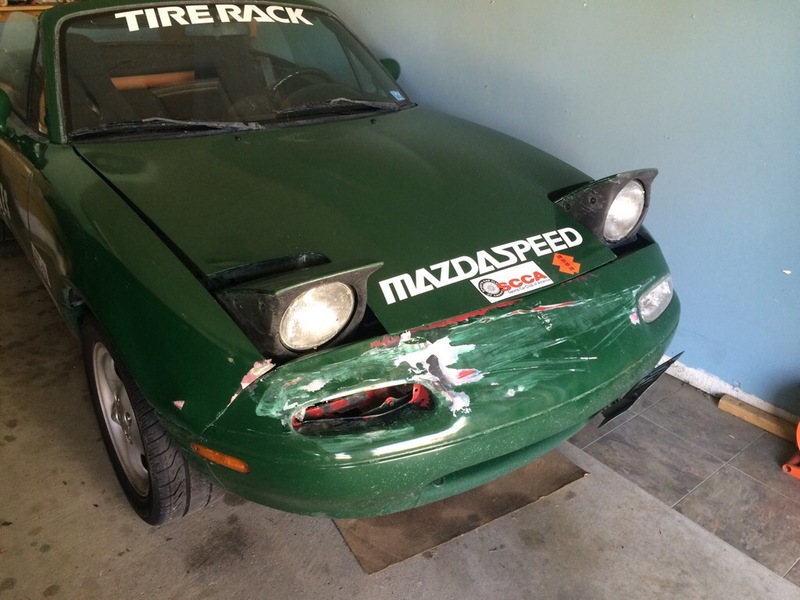 My Miata handled so well. I could even feel some kind of precision as I turning into the apex. It has power, it has grip (at lest for what you can get with such cold surface), and amazing handling. All together, I felt very good as I finish all my run. My best was on my 4th run out 5, 48.916. It was good enough to put me on 2nd place in 23 car deep Street Open class. I was 0.06 seconds behind the first place, and the third place was only 0.08 second after me (in PAX). hm.. I start using the new plugin to create the link, and I guess it’s not working the way I thought it should… I guess I gotta go check the settings! I made a change to the plugin settings, so let’s hope this will work next time….